At least they didn't use the NT Trinity, right? This is why Greeks are so awesome at installing granite countertops. Here is another one, saint Mark of Ephesus trampling the pope of Rome, with saint Justin Popovich (right) and saint bishop Nikolai Velimirovich (left) and Lord Jesus Christ above all. It still doesn't make such imagery right or suitable for veneration. Iconography should never be corrupted by polemics or anger. The saying written between Sts Justin and Nikolai should not be there, either. I think in days of dirty ecumenism business, we need few icons like this. It is reminder, not polemics or anger. I would note that there is a relativity lucrative and large business of selling and making "unofficial" and "un-Orthodox" icons in the former Yugoslavia. I have personally been in small apartments stacked to the ceilings with these "homemade" icons: such "icons" cannot be considered the same as the Holy Icons of the Holy Church made by her monks and nuns in the monasteries. 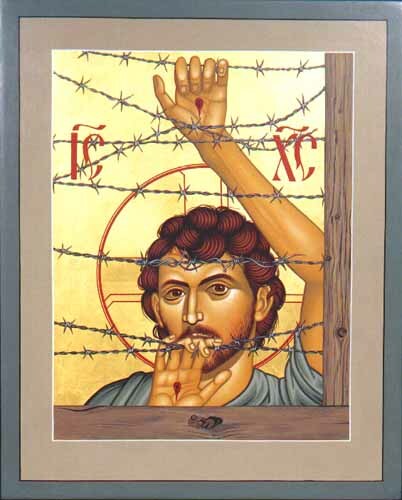 In addition, it was a practice of the communist regime and its supporters to make "icons" of such non-Orthodox people but to uphold those secular defenders of the Party and so forth (I have one such "icon" myself -- given to me as a gift). I've always been told using icons for polemical purposes like this is wrong. I wondered about that too. I've never seen any, as I recall. There's the delightful nuttiness of the add-on to the traditional Mystical Ark of Salvation icon to include the Pope, Luther, and international Jewry shooting at the Church. I viewed this icon hanging in a Monastery I visited. 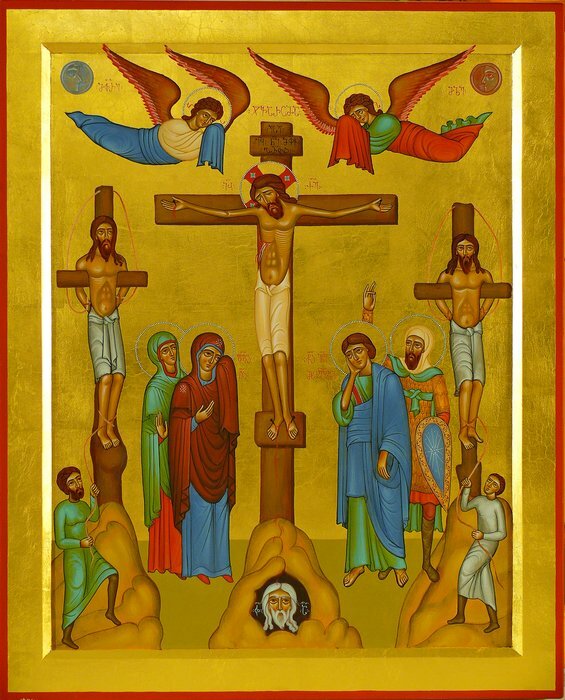 There are definitely older versions of this icon- I personally saw a version dated to Russian in the 1700's. However a ROCOR priest said he witnessed this particular one being painted by a monk in the USA while listening to Rush Limbaugh (he wasn't joking). 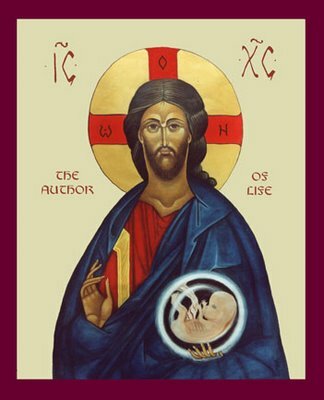 I've seen that icon in the lobby of my local ROCOR parish. A very curious icon of Jesus Christ I found today, by Br. Robert Lentz. I don't see the Jews. There's a boatload of them. The guy on the far right beyond the Antichrist on the horse. He's holding a moneybag and has a yellow star on his hat. 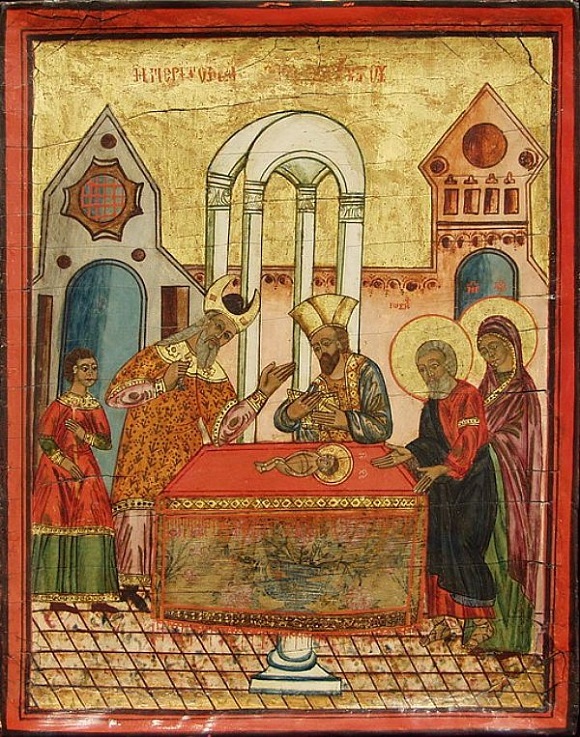 Circumcision (1 January), not Presentation (2 February). If you say so. Too small for me to tell. I'm just going by Dormition Skete's website. From left to right, Antichrist is depicted as a king on his horse and behind him is an old man with a crown on his head, signifying Israel with the star of David on his crown, holding a bag of gold. What's with the stalker underneath the Christ? Yes, all the Apostles were Jewish. ^Love the fire alarm (I think that's what that red thing is). The guy in the middle has a hat that goes to the chandelier. Wowsers. Never seen that picture before. Would it be considered strange if it were an Old World city? The native Americans in mandorlas on the left and right ..... if they're representing Christ and the Mother of God, then this "icon" belongs in the schlock file. Neither Christ, nor His Mother, were native Americans. The freeway is a nice touch. But they were Ethiopians, right? They sure weren't native Americans. Since icons are "written" maybe a misprint? I'll try to care, but failure is inevitable. I just en-joy.